Republicans To CNN And NBC: No Debates For You : The Two-Way The GOP says upcoming film projects by the networks show "clear favoritism" toward potential Democratic presidential contender Hillary Clinton. The networks say the films aren't even finished and have nothing to do with their campaign coverage. But Republicans say they won't debate on CNN or NBC. 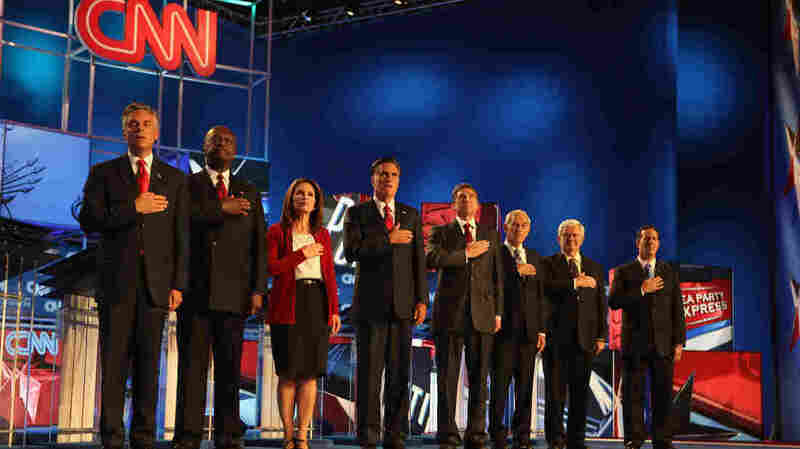 During the 2012 campaign cycle, CNN was among several news networks that hosted Republican debates. Now, the GOP says it doesn't want to be on either that network or NBC. Following through on an earlier warning, the Republican National Committee on Friday "unanimously passed a resolution preventing the committee from partnering with CNN and NBC for debates if they don't drop their Hillary Clinton productions ahead of the 2016 presidential election." "CNN and NBC have shown clear favoritism, and they won't be hosting a single Republican primary debate," said RNC Chairman Reince Priebus. As our colleague Frank James has written over at It's All Politics, "commotion over a pair of movies that haven't even been made proves, if anything, that the Clintons need not lift a finger to inspire a controversy." "CNN is planning a documentary about Clinton's life and career, while NBC's project is a scripted miniseries. Representatives from both networks have said the projects will not color their news coverage of Clinton's potential candidacy." NBC News notes that its spokeswoman, Erika Masonhall, "said in a statement earlier this month: 'NBC News is completely independent of NBC Entertainment and has no involvement in this project.' "
"This documentary will be a non-fiction look at the life of a former First Lady and Secretary of State. The project is in the very early stages of development, months from completion with most of the reporting and the interviewing still to be done. Therefore speculation about the final program is just that. We encouraged all interested parties to wait until the program premieres before judgments are made about it. Unfortunately, the RNC was not willing to do that."